Central School CHIPs students unearth interesting facts. History is made every day. Scholars say that teaching children about history has many important benefits, including providing a sense of identity, helping to improve decision and judgment skills, and learning from the mistakes of those in the past. History provides a context from which to understand others and ourselves. For six students in the District 62 Central School Children of High Intellectual Potential (CHIP) Program, the study of the history of their hometown has allowed them to time travel through the ages to better appreciate and understand the evolution of Des Plaines. 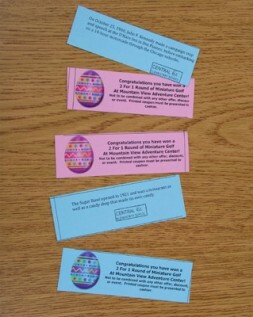 In a collection of brain storming sessions, the students determined the process for researching the information and then educating their classmates and the community about their findings. One of the first problems to be solved was how to disseminate the information. 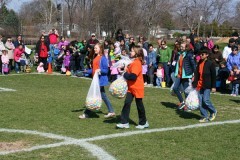 Kurutz, a dancer with the Des Plaines in-house dance company, Artistry in Motion, suggested that the historical facts the students collected could be “stuffed” into the plastic Easter eggs set out at the annual Des Plaines Park District Easter Egg Hunt. They contacted Cindy Yelich, Special Events Supervisor and coordinator of the event, who agreed to collaborate with the students on the project. Yelich presented a tutorial on the development, financing, marketing, and implementation of Park District programming. “This project has provided the Central School students with an opportunity to practice college-level research and literacy skills, while also pursuing a local topic of interest,” said Yelich. A field trip to meet with Reverend Dr. William G. Grice III, in his museum-style home, taught the students how experiences become memories and, therefore, become a part of our history. He talked about his own family’s historical roots in Des Plaines, and showed them artifacts, receipts, deeds, permits, records, photographs, and a diary kept by his Aunt Savena Ahbe Gorsline, the first Miss Des Plaines. In addition, the students used books and online sources to gather approximately one hundred facts; seventy of which were typed, printed, and stuffed into five hundred of the plastic Easter Eggs. Rohan Balchandani: the Ottawa, Chippewa, and Potawatomi Native American tribes originally inhabited Des Plaines. Eleanor Bechtold: Des Plaines was once known as the City of Roses because of all the greenhouses. Cory Cordier: The Choo Choo Restaurant, originally owned by the Ballowe family, opened in 1951 and served food on a model train at the counter. Julius Kreh. These colored chalk pencils became known as the phonetic antecedent of today’s crayons. Emily Kulaga: The site where Prairie Lakes Community Center now stands was an onion field. Rose Kurutz: My great-grandfather, William Shorts, was the first Des Plaines policeman to die in the line of duty in 1927. 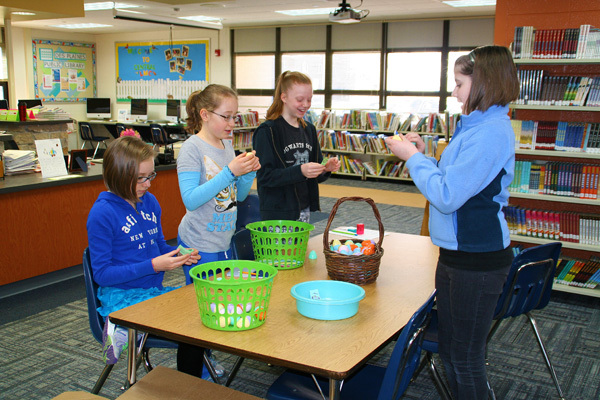 Nell Jakoniuk, Emily Kulaga, Rose Kurutz, and Eleanor Bechtold stuff plastic Easter eggs with facts about the history of Des Plaines. 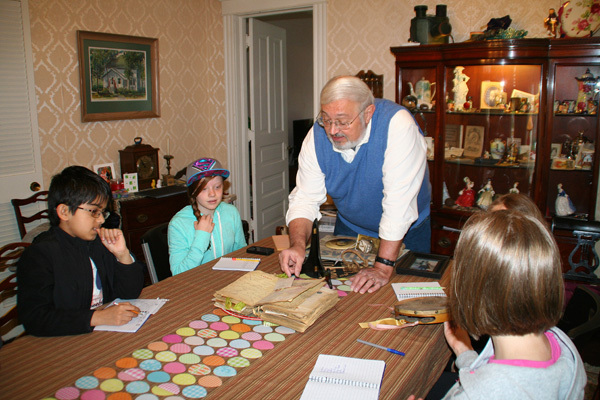 Reverend Dr. William G. Grice III shows the Central School CHIPs students his Aunt Savena’s diary during their visit to his home. An example of the kinds of historical facts that the Central School CHIPs students researched for their Problem Based Learning History project. 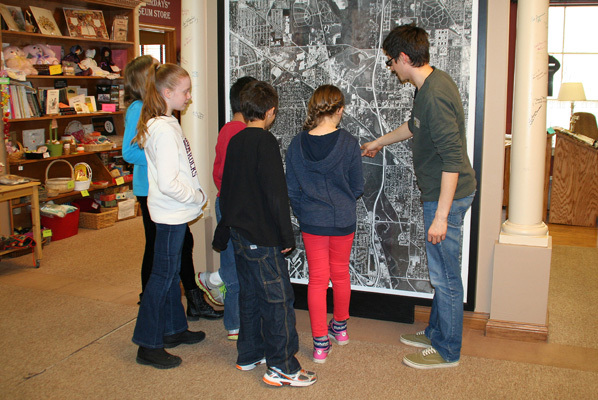 The Central School CHIPs students listen as Philip Mohr, Collections & Historical Interpretation Assistant at the Des Plaines History Center, shows them some topographical changes in Des Plaines. Leigh Radnitzer, (left) and the Central School CHIPs students listen as Cindy Yelich, Special Events Supervisor, talks about what is involved in hosting a free Easter Egg Hunt at the Des Plaines Park District.